New York new wavers stick to what they do best on their third long-player -- but hint at future directions. Midway through track nine of Stellastarr*’s third album, you realise this decade’s debt to the 1980s has overlooked one vital link in the bloodline from mid-1980s camp Smithsian indie to late '80s baggy and shoe-gaze: that of the mid-decade, NME-instigated C86 movement, a genre Primal Scream briefly flirted with, but which ultimately yielded few, if any, big acts. But what’s the big deal about Stellastarr* reviving an oft-overlooked, primarily English movement? A band who, even six years ago at the height of their popularity, would barely have registered on anyone’s radar? Well, while the bulk of Civilized hangs on the coat-tails of the Strokes’ garage rock/new wave movement -- with added effervescence -- like it’s 2003, this one track hints at a step forward for the band. You see, since their debut -- in 2003 -- Stellastarr* have barely moved on. Over the course of their three albums, they’ve stuck rigidly to a sound that, agreed, has pretty much defined the decade in indie terms, yet in 2009 is beginning to get a bit tired. The fact that Civilized is their first album not on a major label, but instead on their own Bloated Wife Records, speaks volumes. Their thinking is probably not to fix anything that, even when everyone else has moved on, doesn’t appear to be broken. So, predictably, opener ''Robot'' pummels along with synth-enhanced, new wave intent, carrying a tune that wouldn’t be out of place either in a nightclub or in a dingy, New York basement bar. ''Freak Out'' continues the trend, reviving frontman Shaun Christensen’s David Bryne-esque delivery that was all over their self-titled debut album. Verses that jar on first listen, but later endear themselves, are bolted to a cast-iron chorus, and it’s almost as if it’s the ‘80s all over again, such is the authenticity of Stellastarr*’s sound at times. By the time we get to the skyscraping U2-isms of ''Tokyo Sky'' it’s clear there’s little doubt about Stellastarr*’s intentions: no major musical departures this time round. And despite the title, this album appears to be, for the most part, anything but civilized. This is an album that intends to have fun, it fixes you with an almost-demonic stare, demands to be danced to, and keep going until you like it. And then, shortly after pyrotechnic-charged new-wave assaults from ''Graffiti Eyes'' and ''Numbers", comes "Move On? ", which, as we’ve already acknowledged, delves into the '80s musical landscape a little further, albeit adding a noughties sheen -- and comes out dressed in faded blue denim, flowery shirt and a Morrissey quiff, just like it was actually there during the brief day in the sun the C86 movement enjoyed. And it contains some of the album’s finest couplets, even on an album that, lyrically, is surprisingly strong. Whether or not ''Move On'' is a hint at Stellastarr*’s future direction, or whether they’ll continue to stick resolutely to their new wave remains to be seen. For now, they’ve created an album based on a sound they made their own. A sound, incidentally, that has been xeroxed in recent years by both the Killers and Franz Ferdinand. 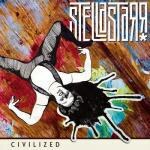 But undeterred by fashion and musical movements having moved on, Stellastarr* have created a joyously out-of-step album. And it deserves to be heard.